If you really take the time to think about our human capabilities in terms of problem-soving, innovation, creative expression, artistic creation, program development, community development, technology, communication, use of resources, and more, there is likely something in this world that blows your mind. Human creativity has no bounds. Above is a picture of a paint-ball adventure I went on years ago while doing youth work. 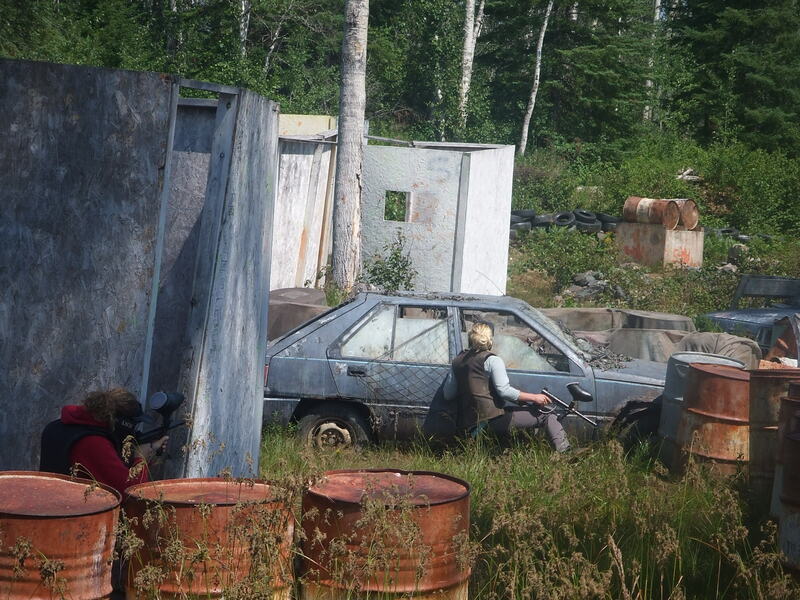 It’s not just the fact that someone came up with the idea of paint-balling that is impressive, but that people have put their imagination into action and created a source of fun and entertainment using forest landscape, old dump-yard materials, and a concept of war-related, adrenaline-seeking excitement to draw people in to a real life video game. cell phones, flip-flops, the Great Wall of China, engines, bridges, art – of all kinds, sail boats, paddle boats, airplanes, dance choreography, welding, yoga mats, fabric, gardens, backpacks, musical instruments, wood products, plastic, plastic surgery, any surgery, architecture, landscaping, sports, cultural norms, chanting, facebook, smart boards, smart cars, haul trucks, trains, igloos, tents, umbrellas, Gortex, space shuttles!, moon boots, hair spray, t-shirts, the lonely planet guides, film, National Geographic, publishing, electricity, toilets, corn rolls, keys, money, dog leashes, paper clips, zip ties, the Colosseum, stadiums, sound systems, machine guns, paint-ball guns, video games, computers, computer games, computer programs, i-everythings, blogging, microwaves, recipes, chemistry, ceramic tiles, to-go mugs, bus tickets, bingo, television, hair elastics, and ice cube trays. Everything has been created. Each person chooses how to use his or her creativity – pro-socially or for personal advancement. Either way, we have certainly proven that creativity knows no bounds. Some people are cynical about the direction the world is going in. I agree we need to be better aware of the impact of our actions on ourselves, other living beings, and on our planet. With our potential for creativity, however, also comes the potential for problem-solving. I don’t doubt that with each social problem we face, someone or a group of people will always rise to advocate for an innovative approach to bringing greater peace and justice to way we deal with issues collectively or through social movements. It’s the people who have either given up on tapping into their creativity all together or who have resigned to use their creativity destructively that push the pro-social innovators to innovate, move, and create change. Thank you to all of the movers, shakers, and people who are willing to take a stand in a creative way. Songs, art, documentaries, poetry, photography, and dance are among some of the most powerful ways to communicate a message so that people will hear.